This week Blythe updates us on injuries during the Ontario, CA tour stop and the Russians vacation-training in Spain. Uncle Tim reviews the post-Olympic show. Spanny Tampson opines on Chris Brown and the Fierce Five at the VMA’s; and in the first of a two-part series, we talk to NBC commentator Tim Daggett about his life-threatening injury and what he wants his critics to know. Next Week: In part two of our interview with Tim Daggett, he vents his frustrations about the code and the death of the perfect 10, “I hate it.” Find out who he thinks can benefit from being more kind. 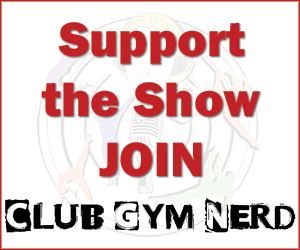 Have you thought about adding a jingle to the gymcast? Oh no! Try a different browser. Do you have Chrome,Safari or Firefox? Give it a try on one of those. We will have the podcast up on iTunes soon. I’m really excited for the next podcasts! Good job!!!! !